We have the answer to the first (with more reading here). 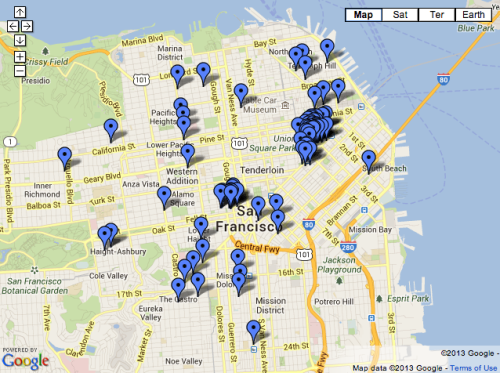 StyleForum, meanwhile, just released some interactive shopping maps for the second. They cover eight major cities – Paris, London, Milan, Rome, Florence, Boston, San Francisco, and Los Angeles – with dozens of shops in each locale. Note, these aren’t meant to cover every menswear-related shop; they reflect what StyleForum’s editors (and community) think might be worth your while. The site will also be coming out with more personalized lists in the future (e.g. StyleForum co-owner Fok’s “top ten in Boston”), as well as build on their existing databases (more stores, more locales). Next time you’re headed somewhere new, you may want to check their “city maps” tag to see if they have something on your destination. Some other good shopping guides: Stephen Pulvirent did one for Chicago and Grant Harris has one for Washington DC. I also wrote some things about the tailoring shops in Naples and Rome, if you’re ever in Southern Italy.